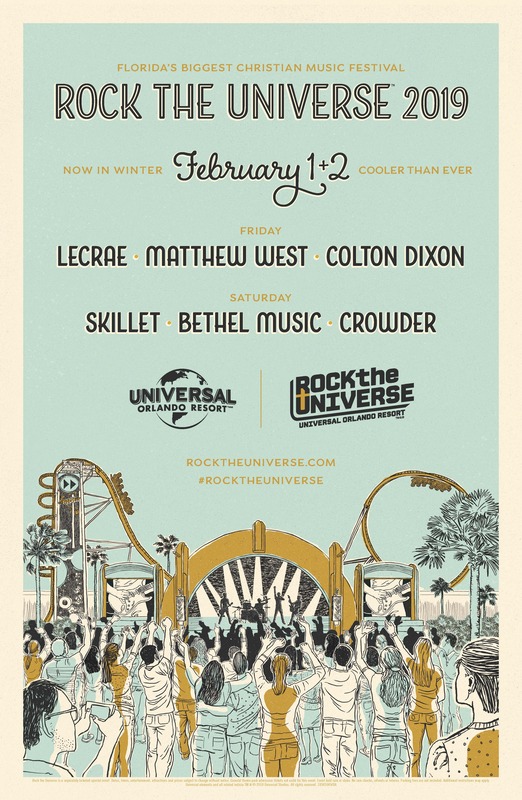 Universal Orlando’s Rock the Universe 2019 – Florida’s biggest Christian music festival – runs from Feb. 1st-2nd at Universal Studios Florida, featuring live performances by the genre’s most compelling talent, along with worship experiences, theme park thrills and more. For the ultimate Rock the Universe experience, guests can take advantage of a 2-Park Rock Your Weekend ticket offer for $127.99 plus tax. This offer can be used at one park per day, allowing guests to experience Rock the Universe and the fun of Universal Studios Florida and Universal’s Islands of Adventure. GRAMMY-nominated Christian rock band, Skillet, GRAMMY award-winning hip-hop artist Lecrae, and the chart-topping artists of Bethel Music, are among the musical talent performing live. Fans will also enjoy autograph sessions with their favorite artists and live performances by up-and-coming talent in the FanZone presented by Coca-Cola. Rock the Universe guests also have access to a Saturday candle-lighting ceremony in the heart of Universal Studios Florida and Sunday morning worship service. For additional ticket offers and concert details, visit www.RocktheUniverse.com.